The New Hampshire Senate recently passed two resolutions — SCR 3 and SCR 4 — both calling for an Article V Convention. SCR 3 is sponsored by WolfPAC, an organization that can charitably be called left of center. It was founded by Cenk Uygur, of The Young Turks, who among other things, denies the Armenian Holocaust, and openly advocates a runaway Article V Convention, as he says in this interview with Harvard Professor Larry Lessig. WolfPAC’s top lobbyist is Ryan Clayton, the organization’s executive director. When he testified in NH last year, he angrily denounced opponents of an Article V Convention as “conspiracy theorists” for their concerns of a “runaway convention”. Yet, its founder is on record supporting a runaway convention. While WolfPAC isn’t registered as a lobbyist organization in NH, Mr. Clayton certainly shows all the signs of being a lobbyist. 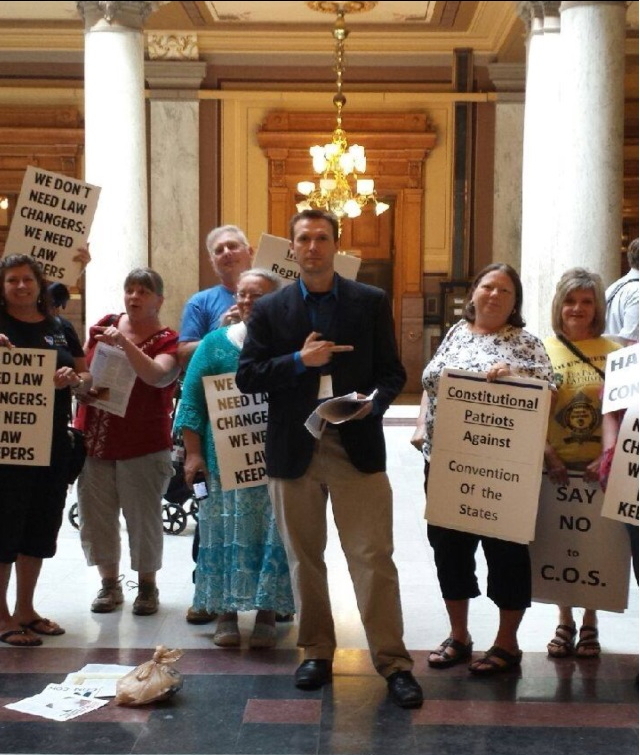 He comes across as professional and polished when he makes his rounds in the NH statehouse, but shows his true colors as seen in this picture where he is making an obscene gesture at opponents of an Article V Convention at the Indiana State House a few years ago. Larry Lessig, another supporter of SCR 3, is a left-wing Harvard Professor, a former advisor to President Obama, and openly advocates a rewrite of the U.S. Constitution. He is one of the key leaders in this modern day call for an Article V Convention. He is involved with the groups New Hampshire Rebellion, and Move to Amend. He denounces big money in politics yet started MayDay PAC and raised $12M. MayDay PAC spent close $2M supporting Jim Rubens’ bid for a U.S. Senate seat in 2014. So much for getting big money out of politics! Oh yes, Larry likes to mock Christianity Amazingly, only two Republicans out of 14 voted against HCR 3 in the New Hampshire Senate. The organization behind SCR 4 is The Convention of States Project. Here is a link to a short video from Living Room Conversations with Meckler, Jones and Blades. If you visit the organization’s website you will find a quote from Mark Meckler endorsing Living Room Conversations where he makes the claim that elites run Washington, D.C. and state capitals. Joan Blades is a founding partner of Living Room Conversations, co-founder of MomsRising.org and MoveOn.org as well as co-author of The Custom-Fit Workplace: “Choose When, Where and How to Work and Boost the Bottom Line” and “The Motherhood Manifesto”. Trained as an attorney/mediator, 10 years as a software entrepreneur and always a nature lover, she is also an artist, mother and true believer in the power of citizens and our need to rebuild respectful civil discourse and embrace our core shared values. Living Room Conversations partners with New Hampshire Listens, a facilitation group for the Carsey Institute, an NGO based at the University of NH which steers the agenda of NH’s unelected commissions. Together, these groups promote the concept of regionalism around the state. NH Listens trains the “facilitators” who help towns conduct Delphi sessions for public input on plans that never came from the public in the first place, but which seek to plan every aspect of our lives. As reported a few months ago, Convention of States New Hampshire, whose lobbyists delight in trashing any and all who oppose their agenda, was caught in a lie back in February. In an email to its supporters in the state, a COS official accused NH Senator Kevin Avard of taking a bribe from The John Birch Society. When it was exposed, a tepid apology was offered to the Senator, but it took another two months before an apology was made to The John Birch Society. Convention of States lobbyist Ken Quinn of Maine, who once denounced an opponent of an Article V Convention as an out-of-state operative who only opposed an Article V because he was paid to do so, comes across as a conservative who only wants to pass a few reasonable amendments that will restore our republic. But like his colleagues on the Left, Quinn claims that the U.S. Constitution is the problem, and like Convention of States leaders Michael Farris and Mark Meckler, calls for “structural change” of the U.S. Constitution. This is not exactly a position held by most conservatives. We certainly hope that the New Hampshire House Republicans who call themselves conservatives see through these two well-funded lobbyist organizations, and reject any new calls for an Article V Convention. We ask that they repeal the one call that it already has.